I've been following this thread on Surfer forums where Kaser and others are talking about modifying the tails of IWA and Maliko setups. the photo below is great comparing the wing Alex modified to a KAI wing. Can anyone that has one do me a huge favor and measure the span of the KAI tail so I can modify my tail to the same dimensions? I don't have one, but I can tell you this--you don't really want to go to the same dimensions. The Kai tail doesn't balance the Iwa or M200 wing very well. I tried one and had to move my footstrap forward more than an inch to get my nose down, and it didn't feel right. I took an inch and a half off one of my Maliko tails, and it was a little too much. An inch would be good. Agree with Bill...I'd see if you can borrow a Kai tail to try before you go cutting down your Iwa/Maliko tail. I too heard about the wonders of the Kai tail with the Iwa wing, and I "wondered" what all the fuss was about. Don't feel that much more turn-ability (yes, it was "looser", but more of a tail slide than a quicker, shorter, grabbing turn from it), and felt as though there was nothing there to pump with when I needed it. 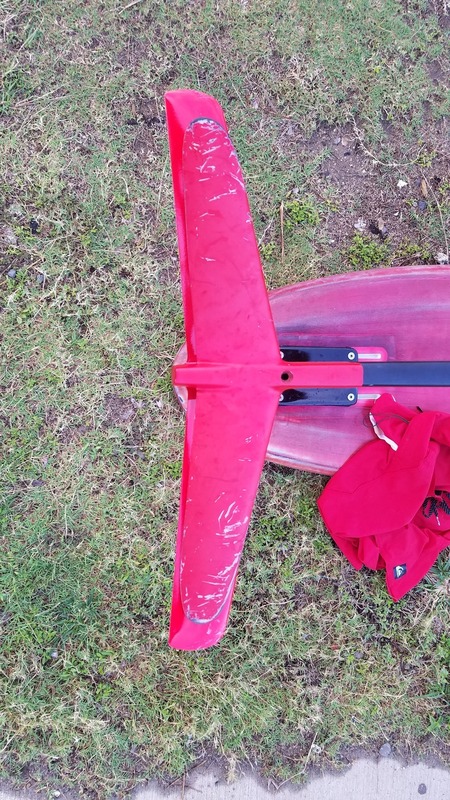 I know a couple prone guys on some tiny potato chip crumb boards are loving it, but know of only on SUP foiler that stayed with the setup, and swears by it....the rest of us went back to the regular Iwa/Maliko tail.